The beautiful Lake Tahoe area is one of the most popular vacation destinations in the southwestern US. At the Tahoe Sands Resort, you’ll enjoy both the mountains and the lake, as well as easy access to nearby restaurants, casinos, and parks. The cool, clear water of Lake Tahoe is ideal for fishing, water sports including skiing, tubing, and sailing, or simply as a tranquil backdrop for your picnics and hikes. The resort even includes a private sand beach, where you can pull up a chair and soak up the sun. Located less than an hour’s drive from the Reno/Tahoe International Airport, and roughly a two-hour drive from Sacramento, California or an hour’s drive from Reno, Nevada, this vacation ownership property is on the northwest shores of Lake Tahoe. 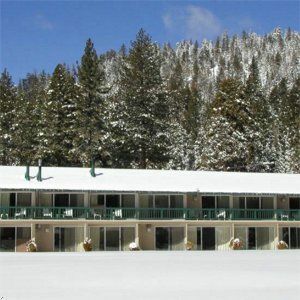 Situated within the Humboldt Toiyabe National Forest, and only minutes from the 100-acre North Tahoe Regional Park, this timeshare is a great location for accessing nearby facilities for night tennis, racquetball, biking, or the winter sports area at the Northstar ski resort. Comfy accommodations, many built cabin-style, await you at your Tahoe Sands Resort timeshare resale or vacation rental. Roomy two-bedroom units sleep up to six adults, and include a partial kitchen, one-bedroom floor plans sleep up to four and have a mini kitchen, and studios are available with a murphy bed to sleep two or a murphy bed plus a double sleeper sofa to accommodate a total of four vacationers. Partial kitchens, which are also included in studio units, have a dishwasher, range, sink, and refrigerator. Tahoe-style cabins with rustic charm and mountain views are set in the woods, while condo-style accommodations are near the lake. Many units have knotty pine paneling, fireplaces, decks or patios overlooking the lake or mountains, and other décor touches that add to the charm and appeal of your woodland retreat. For on-property fun and relaxing, this Tahoe Vista, California timeshare has a heated swimming pool, sauna, hot tub, kayak rentals, playground, barbeque area with gas grills, sports court, and a putting green. Onsite laundry facilities add to the convenience of vacationing at the Tahoe Sands. Contact Tahoe Sands Resort Specialist Today!